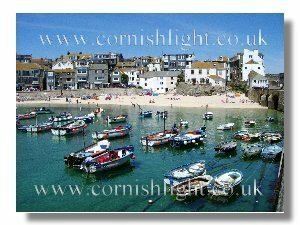 St Ives - the town takes its name from St Ia, a Saint, that legend has it ,sailed across the Irish Sea to Cornwall in the 5th Century on an ivy leaf. Over the centuries a thriving settlement, largely dependent on fishing , grew up around the harbour and the Island. This area of narrow streets is known as Downalong by the residents. On the Island is St Nicholas Chapel, dating from medieval times but much restored at the turn of the last Century. The Island offers superb views back into the harbour, across the Bay to Godrevy Light. The town's fine parish Church is named after three saints: St Ia, St Peter, St Andrew and was consecrated in 1434. By the middle of the last century the town boasted a fishing fleet numbered in hundreds of vessels. The Harbour was packed with the distinctive dark brown sails of the Cornish Lugger, landing huge catches of both pilchard and herring. These would be baulked in salt before being packed into wooden barrels and boxes for export, particularly, to the Mediterranean Countries. Visiting schooners, ketches and barques would bring in cargoes of timber and coal for the then booming West Cornwall mining industry. Everywhere would be the smell of fish , and hemp nets and ropes hanging out to dry. Old men sitting on the Harbour Wall watching the world go by. The St Ives Museum gives a fascinating insight into life in the town a hundred years ago.. Artefacts on display include floats made of pigs bladder, cured with tar. Cork bales. Cotton nets. Granite pressing stones, used to weight the barrels, even a wooden shovel. Lots about seining too. The season would last from August thro to October. Look-outs, known as huers, would be positioned on headlands, such as the Island. When a shoal of fish was spotted, they would blow on a trumpet, and then signal the position of the pilchard shoal using flags. The seine with stop nets at each end, would circle the fish, the men beating the water with their oars until the shoal was completely enclosed. The nets would then be drawn into shallower water , where the fish were 'dipped' into the boats using wicker baskets.